What makes the Andean Flamingo different than other flamingos? What are the two big threats that have contributed to their being designated as a vulnerable species? 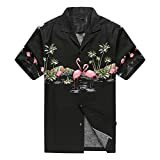 Many of us think of pink flamingos as fun, funky, ubiquitous, and tropical. But, the Andean Flamingo isn't so tropical, and certainly less ubiquitous than the other five species of these wading birds. This particular species of flamingos doesn't quite fit the stereotypes that most of us have about these big, beautiful pink birds. They don't hang out in hot, steamy, tropical climates, like the Caribbean. They live high in the Andes Mountains of South America. And, they aren't so plentiful as their brethren in other regions, either. In fact, they are the rarest of all flamingo species, with a conservation status of Vulnerable. Read on for a basic primer on these fascinating creatures. You'll also discover the two main threats that have earned them a spot on the list of vulnerable species. These flamingos are mountain dwellers. Their natural habitat is the western hemisphere's highest mountain range: The Andes. In winter, you find them feeding in salt lakes high in the mountains of Chile and Peru. They move to the lower wetlands of north western Argentina in the summer. Estimates are that there are only about 34,000 to 38,000 Andean Flamingos in the world. That's very few, compared to some of the other species, which number in the hundreds of thousands to several million. 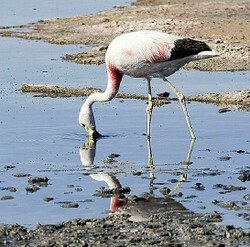 1 - If you want to know for sure that the big pink bird you are looking at is an Andean Flamingo, look at its legs. Are they yellow? Then, you're seeing one! This is the only one of the six species worldwide that has yellow legs. 2 - Other physical characteristics are: paler pink plumage than some of the other kinds of flamingos, prominent black wing tips that shows even when their wings are folded, and black tail feathers. 3 - They are the tallest members of the flamingo family, and can grow to a height of well over four feet tall. 4 - If you see a flock of them flying overhead in the morning, take a good look... that flock may be far, far away by noontime. They are great long distance flyers, and have been known to fly as far as 700 miles in a single day. 5 - They can live up to 40 years. That's a long time! Is This Lone Bird Symbolic? This photographic print of a lone Andean Flamingo is absolutely stunning for more than one reason. First, it's a breathtaking piece of photographic art, showing a lone bird in its natural habitat. You can't help but notice the wonderful symmetry! But it's also striking in that it IS a photo of a lone individual. Flamingos congregate. They're very social, and are normally seen in large stands of hundreds, or even thousands of birds. This one is all alone. With the conservation of this species being listed as "vunerable," a picture of one bird standing alone makes one think about what the future might hold for these beautiful creatures. A species that is categorized as Vunerable is one with an uncertain future. The status is the one in between the less severe "Near Threatened" and the more severe "Endangered." While there are a number of threats to this population of beautiful birds, two in particular stand out: Mining and egg collectors. Mining operations near breeding and feeding habitats has muddied the feeding waters, and raised the levels of the mineral borax. Borax has a toxic effect on flamingos, and may suppress futility. Scientists have helped other species to establish new colonies in safer areas. Maybe they're pursuing a similar course of action for the Andean Flamingo. Though not as prevalent as some years ago, egg collection for human consumption is an extremely serious threat. The practice would more accurately be labeled egg theft! When a bird lays only ONE egg a YEAR, and some ninny thinks it's cool to steal that one egg, it says a lot of things about that person. None of them are favorable. Come on, people - stop stealing flamingo eggs. Get yourselves some chickens! Would you ever eat a Flamingo Egg? You may never have a real, live flamingo taking a bath in your bath tub, but you can have some decorative flamingos your bath. Zazzle's growing stable of printable home decor accessories is worth a look, whether you're seeking flamingos or fantasy art. Matching toothbrush holder and lotion pump sets, as well as night lights, and bath mats are among the bath decor items available there. Decorative ceramic tiles remain a popular item, too. Hang one or a group or them on your wall, either framed or unframed. Or, add a pretty pop of color by using a single one as an accent on your vanity counter. Any of these are ideal for helping you put your own personal stamp on your bathroom decor. CruiseReady, It's easy to raise awareness of the Andean flamingo plight by carrying totes, by including curtains, holders, prints, pumps and tiles in home decor and by wearing cameos and shirts. Now if only the company behind those product lines would set aside a portion of profits to Andean flamingo conservation...! Thanks for the identification tip, now I know. Good article. How do you roll? If you're a flamingo lover, here are a few ways to roll along with them when you go for a drive - fun Pink Flamingo Auto Accessories.